The ways to mechanize supporting operations of processing machines and food production lines have become an urgent problem. In many manufacturing companies, supporting operations are performed manually due to the shortcoming of existing machines. The paper considers the reasons for research and development of foodstuff transferring devices. They will perform a number of operations in the kinematic cycle: gripping, holding, transferring and releasing the item. The most important indicators of transferring devices will include efficiency, power consumption, accuracy of gripping and releasing operations. The ways to enhance the performance of theoretical methods for reducing energy consumption and technological machines are discussed. The ways to improve transferring devices are presented. Keywords: technological process, manipulator, gripping device, goods, productivity. Shahumyan G.A. Machines and automatic lines. – Moscow, 1961. 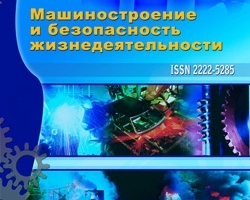 – 522 C.
Device for transfer wares / Gorlatov A.S., Sereda N.A. // Pat. Russian Federation № 2412046. – № 2009101727/02; stated 20.01.2009; publ. 20.02.2011 in BIUM, 2011, № 5. Device for transfer wares / Gorlatov A.S., Sereda N.A. // Pat. The Russian Federation № 2438858. – № 2010109574/02; stated 15.03.2010, publ. 10.01.2012 in BIUM, 2012, № 1. Device for transfer wares / Gorlatov A.S., Sereda N.A. // Pat. The Russian Federation № 2438857. – № 2010109573/02; stated 15.03.2010, publ. 10.01.2012 in BIUM, 2012, № 1. Sereda N.A. Improvement of manipulators for transfer of piece wares, with reference to technological lines of food production // Proceedings of II International conference «Modern mechanical engineering. Science and education». – St-Petersburg, 2012. – P. 670–679. Sereda N.A. Analysis of the manipulator’s design for transfer of piece wares with a complex movement of the leading link of the actuator // Machinery and technology, 2013, № 2. – P. 7-13.